What does RoRo shipping mean? - how much does it cost? - What is Roll On / Roll Off? - Vessels and ships! Compare RoRo car shipping against the FCL auto transport mode. You can find a quote example at the bottom of this page. Find the service you need and ship your vehicle in a safe manner at affordable price. Are you trying to find a cheap way of transporting a car? Roll on Roll off car carrier is what you need! Find out what RoRo shipping means. Do you prefer more safe method of shipping a car than RoRo? Check out what FCL has got to offer. Get maximum protection for your car. Our professional customer support keeps our clients coming back to us and refer our car shipping services to their families and friends! Nowadays cargo vessels are used to ship everything we need in our everyday life. Without them, the intercontinental transportation of raw materials, cars and goods would be impossible or much more expensive than it is now. Over many years due to the constantly increasing demand for the sea shipping and the raising volume of transported goods countless type of shipping vessels have been designed. About their classifications, criteria, you could write an encyclopaedia. On this site we are going to focus on RoRo Car Carriers designed to ship all type of vehicles – personal auto, transit vans, lorries, camper vans, buses, agricultural and building machinery and any other vehicles that are in full working order and on wheels. 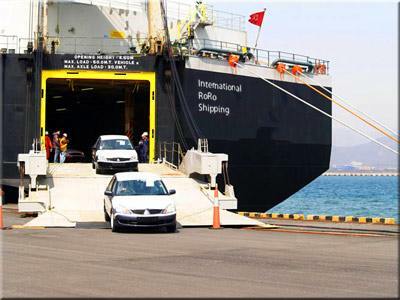 We will explain why RoRo car transport to Australia is the cheapest way of shipping your BMW, Porch, Jaguar or Mercedes, what are the advantages and disadvantages of using the Roll on / Roll off auto delivery services, what ships are used and how to organize the RoRo shipment. 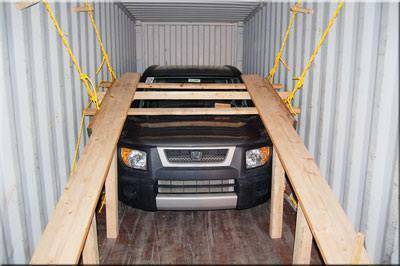 We will explain pros and cons and the main differences between moving you car by RoRo and in a container. The loading space of such a RoRo vessel is divided into many decks of a small height. Some of the decks can be also moved vertically which allows adjusting the height of the particular level to the type of the cargo. 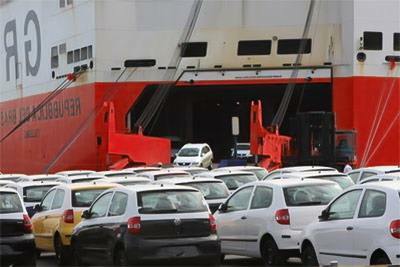 Loading and unloading of vehicles is carried out in the RoRo system. The cars are driven on and off through the special gates with ramps at the stern and the sides of the RoRo ship, connecting the waterfront decks with the landing pier or wharf. Thanks to these solutions the loading time of the cars has been reduced to just a few hours. Once the motor-vehicles have been positioned they are fixed with chains or straps to the relevant holders on board. RO-RO car shipping is the cheapest method of exporting a vehicle and other cargo on their own wheels or on trailers. Roll On roll Of auto carriers are specially constructed ships to allow the freight to be driven or towed directly on and off the shipping vessel by utilizing the on-board or shore-based loading platforms. 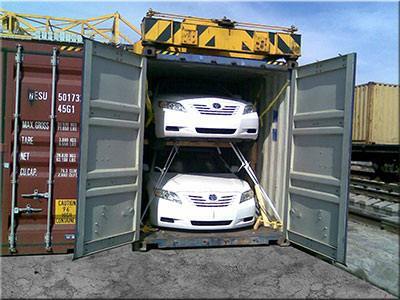 RORO car transporters are made to hold mechanized or self-propelled cargo. In some cases the freight is loaded on the ship on trailers. It is removed from trailers and tightly put one on the other in the storage area. con-ro - a combination of ro-ro and container ship: part of the loading space, usually on the bow of the ship, is intended exclusively for the metal boxes - these are the holds with the guides and rails, like on a typical container vessel, and the remainder, usually aft, that holds the deck sharing cargo space on the internal decks for RoRo cargo. On the con-ro type vessel the RoRo and lo-lo loading spaces are separated and do not overlap, except, in some cases, of the upper deck of a ship that sometimes can be in whole adapted for both handling systems. ro-lo - the unit on which either a portion or all of the load compartment is designed to carry and handle freight in both the ro-ro (horizontal) and lo-lo (vertical) systems. sto-Ro – a ship on which the cargo is loaded be using different types of machines on wheels (so there is the element of ro-ro shipping), then the load is positioned and left. The “sto” word is the abbreviation of stowage which has a few meanings: it is the state of being stored, a space or a room designed and intended for storage. The original and pure sto-ro type shipping vessel have no internal and external ramps. The goods are loaded through the special on board gates with lifts. Dock machines on the waterfront put a piece of cargo on a special platform which is on the same level as the vessel. The platform is a type of conveyor belt which is transferring the cargo to the lift aboard. The lift moves the cargo to the chosen deck where the load is seized by a forklift or a heavy load overhead conveyor working in the hold on the board and moved to the final position. ro-pax - in fact it’s a type of passenger and car transporter, with increased cargo space and reduced area of spaces and cabins for passengers. Ro-pax car carriers are sometimes mixed up with the typical car-passenger ferries. Ro-pax car and container vessels evolved from the original passenger-car ferries. After the establishment of the European Union and its new no cargo duty regulation the demand for the passenger transport began to decline and the freight traffic grew at the same time. For that reason some passenger lines got rid of pure passenger ferries and introduced ro-pax passenger and car shipping vessels. Contact us for a free Roll on Roll Off car shipping prices. We will prepare two options for you and explain what the differences are between RoRo and FCL delivery services. We hope by know you know what does RoRo mean and what it is used for. 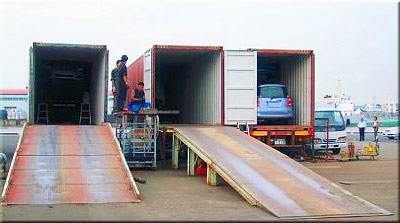 Are you planning to ship your car, lorry or other vehicle to Australia? You are in the right place! We'll provide you with the service you are after! In this section you will find all the information and procedures about importing a car. When shipping auto parts to Australia we provide a reliable and professional spare parts delivery services. We also specialize in shipping other motor vehicles to OZ like trailers, caravans, lorries, buses, removal vans, car transporters and more. Whatever your needs are contact us for a free quote. Our good quality customer service keeps our customers coming back to us and refer our car shipping services to Australia to their friends! Individuals looking to immigrate to Australia from the UK can take their vehicle with them in accordance with Order 12 of the Motor Vehicle Standard Regulations 1989 set by the Australian Government, Department of Infrastructure and Transport. 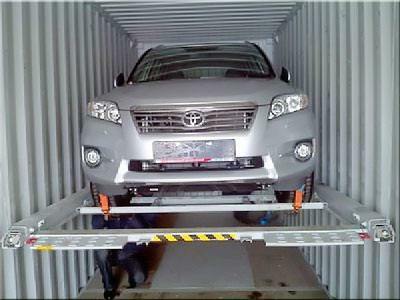 The personal car shipping scheme can be only used by private people. UK firms are not allowed to ship cars to OZ using this solution. To qualify for the personal car shipping option you must have spent at least 1 year in the UK. Also it must be your intention to relocate for life or a long period of time and apply for a permanent residency. If you are planning to go just for holiday or you are on a business trip (including soldiers and politicians) then you are not eligible for shipping a vehicle. The car shipping criteria set are absolutely mandatory and must be met before, during and after the car has been imported from the UK to Australia. If you fail to meet some of the conditions below the permission for transporting a car will not be granted to you. How long you must have owned the car you want to ship? During the qualifying period of 12 months the car should be used by you as a transport vehicle. It should be available to you at any time. For example if you hired the car to someone during that period and the car was used by others you can not include that period within the 12 months qualifying time. The car you own must be available to you at any time. To proof you have owned the vehicle for 12 months prior shipping it you will have to provide the United Kingdom Vehicle registration certificate including the date and the place of purchase. In addition you will have to prove and provide your driving licence. The date you have obtained it should be older than 12 months. You have a right to remain in the Common Wealth indefinitely – for example you are one of New Zealanders – Kiwis. When to apply to export the car? If you want to export your car to Australia you can apply for a permit before you leave the UK. However first you should meet the requirements of the licence under which you want to get your car shipped. You can also apply for a relevant car shipping permit after you have arrived in OZ. However there is the time limit of 6 months. If you apply after the 6 month period has passed by your application will be rejected. How old you must be? If you are under 17 years of age you are not allowed to apply for car transport permit. All UK citizens holding a valid driving licence can apply to ship a personal car or a motor vehicle with up to 9 seats including the driver seat. The vehicle cannot exceed 3,500 kg. The possession of the driving licence entitling you to drive the car you want to import is a must. How many autos can I ship to OZ? How much time do you have to apply for VIP? There are some time limitations to make the application. How much time do you have? Well there are to situations. While in the UK you can apply for a Vehicle Import Approval (VIA) at any time but do not forget about the main condition – you have to own your motor vehicle for at least 1 year before you try to get the VIP. The other situation is when you have moved already and your car is still in the UK. Then you do not have that much time. However it is still quite flexible. You have only or as much as 6 months to request the VIA. To be entitled to apply for the VIP under the Personal Imports Programme and ship a car to Australia tax free you will have to do some work. Again you have two options to apply. You can do it online or you can download an application form in the PDF format, print it, fill it out and post to the Department of Infrastructure of Regional Development. To complete the form you will need basic information which can be found on your motor vehicle registration certificate issued by DVLA. Unfortunately it is not free to apply for the car move permit. It costs about £28. It does not matter if your application had been successful or not you this money will not be paid back to you. Prepare your credit card as it is the best option to make the payment for your Motor Vehicle Import Approval. There are other payment options available too. More details can be found on the application form. You will have to make a copy and provide a purchase invoice or receipt with your personal details on it. You will have to scan and print or Xerox your UK or European driving licence. Make a copy of your Car Registration Certificate. It supposed to show your current address and name. Please remember that you have to have owned the car to be able to ship it for 12 months. If you have travelled overseas during the last 12 months from the date of applying you may breach the rules of the qualifying period. It depends on how long you have spent outside the UK. If you were away due to work you need to provide a confirmation from your employer. You will have to produce and present a statement of travel. Next required document is the copy of your passport photo page. If you hold more than 1 passport it is your responsibility to provide information about both. If you were not born in the Red Country you will have to provide your current visa allowing you to stay in OZ indefinitely. Also if you have shipped a car before you will have to provide previous reference numbers and information about all shipments. Is it worth taking a car to Australia? What auto transport methods are available? What are the charges involved in sending a vehicle overseas? What's the cheapest way of importing a personal car? Can I take 2 vehicles under the personal import schema? What's the average cost of shipping a car? How long does the take to deliver the car to my home in OZ? The shipping of used and new spare auto parts was regulated in 2001 by Australian Customs Office. Unfortunately it is no longer permitted to ship complete cars for dismantling and spare parts recovery. However it does not mean that the shipment of spare vehicle parts has been completely banned and prohibited. The new Motor Vehicle Parts Regulations Office have withdrawn permits for importing full cars that are not registered, are broken and can’t be driven but not for the parts themselves. The new regulations specify when the vehicle is no longer treated as a car and becomes spare parts that can be used for the maintenance or repair of other cars. Why is this so important? Auto parts do not need any sipping permit from the DTRS. Basically there are 3 main decrees concerning parts for trucks, and passenger cars which have been made to make it clear and easy, for shipping companies and international movers, to understand what is considered to be a spare part. It is mandatory to send spare parts in compliance with import of goods regulations under the ACT 1901 otherwise your parts may be shipped back to the UK and you will have to cover all the expenses. 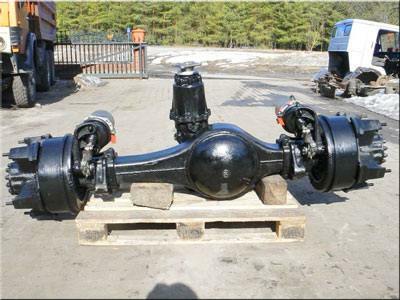 If you want ship a lorry and you want it to be considered as truck parts you will have to remove at least the engine and the gearbox. The engine and the gearbox themselves are considered to be parts. Also it is important that you do not ship the truck body on the same ship with the removed parts. If you are caught you will not be happy at all. If you are planning to ship a damaged or broken passenger car for parts you have to make sure the engine, transmission and all wheels and axles are removed. Again the car body can’t be transported on the same ship with the removed parts. 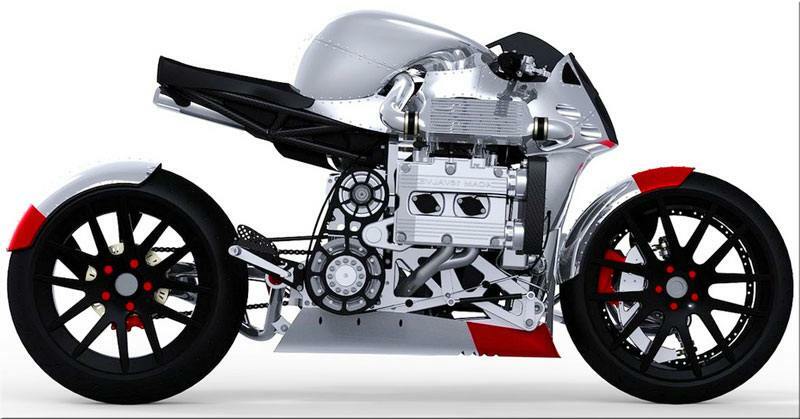 To be allowed to export motorcycle parts you need to remove the front forks, steering and wheels. And again no transportation of those parts on the same vessels is allowed. Do not take your chances to move all spare parts on the same ship. All shipments are very properly checked from time to time by the customs officers. The financial fines are just too high. You will be also put on a black list and all your future spare auto parts transports will be exactly screened. For more information on shipping auto parts please contact us directly. We can also ship parts for different types of industrial machinery. Also please note there are different importation tax rates on different parts. If you are exporting a car you can put some spare wheels, bulbs, air and petrol filters and other parts inside. They are much cheaper here in the UK than in OZ.